We’d love your help. Let us know what’s wrong with this preview of The Bronte Family by Karen Smith Kenyon. A joint biography of Charlotte, Emily, Branwell, and Anne Bronte, exploring how the siblings sparked creativity in each other and how their lives were woven into their novels. To ask other readers questions about The Bronte Family, please sign up. ARC provided by NetGalley & Endeavour Media, for release of a new edition, in exchange for an honest review. Thank you! I have always had an interest in the Brontë family ever since I was young. I first visited the Brontë Parsonage when I was 10 and I was incredibly interested by the Brontë sisters lives. This biography spoke deeply of all the Brontë sisters lives as well as their brother, Branwell. I learned quite a number of things about the family from this read - especially in terms of B ARC provided by NetGalley & Endeavour Media, for release of a new edition, in exchange for an honest review. Thank you! This biography spoke deeply of all the Brontë sisters lives as well as their brother, Branwell. I learned quite a number of things about the family from this read - especially in terms of Branwell and his troubled life. This was an informative and enjoyable read and I would recommend it to anyone interested in the Brontë family or any of their wonderful works. Reading this has made me want to reread my first ever edition of Jane Eyre which I bought at the Parsonage at 10 years old. Such an inspiring story to writers - that these sisters worked through all their hardships and found enjoyment in writing. Although Emily, Anne, Charlotte and Branwell had short lives they were full of potential and success in their own ways. It is a shame that such talent was lost. This read really brought the family back to life quite like my multiple visits to the Brontë Parsonage. I loved learning about The Bronte Family through Author Karen Smith Kenyon's research and writing. I was enamored with the romantic and dramatic lives of Reverend Bronte and his six children. The photographs and sketches in the book are amazing. There lives were amazing and devastating. I'm looking forward to reading Jane Eyre and Wuthering Heights. And I would love to visit The Bronte Parsonage Museum in the Yorkshire Village in Haworth. I give The Bronte Family 5 stars for its informative read. I loved learning about The Bronte Family through Author Karen Smith Kenyon's research and writing. I was enamored with the romantic and dramatic lives of Reverend Bronte and his six children. The photographs and sketches in the book are amazing. There lives were amazing and devastating. I'm looking forward to reading Jane Eyre and Wuthering Heights. And I would love to visit The Bronte Parsonage Museum in the Yorkshire Village in Haworth. I give The Bronte Family 5 stars for its informative read. Aah, the Brontë sisters! What geniuses they were and how miserably short their lives. And yet their few years continue to fascinate their readers. Sadly I am still far away from visiting Haworth, but it has been on my list ever since I first read Jane Eyre. As a devout Brontë fan I try to get my hands on every book written about them and the latest instalment is The Brontë Family by Karen Kenyon. Thanks to Endeavour Media and Netgalley for providing me with a copy of this book in exchange for an Aah, the Brontë sisters! What geniuses they were and how miserably short their lives. And yet their few years continue to fascinate their readers. Sadly I am still far away from visiting Haworth, but it has been on my list ever since I first read Jane Eyre. As a devout Brontë fan I try to get my hands on every book written about them and the latest instalment is The Brontë Family by Karen Kenyon. Thanks to Endeavour Media and Netgalley for providing me with a copy of this book in exchange for an honest review of this book. I love the Brontë sisters. Once I discovered English literature through the brilliant Jane Austen I swiftly fell for Charlotte, Emily and Anne as well. I must admit, however, that Emily is my undoubted favourite. There is something so visceral and wild about Wuthering Heights that has, in my opinion, never been topped. But this is true of all the Brontë sisters. They were true in a way that was rare, honest almost to the point of painful and undoubtedly gifted. What fascinates me is how they penned three fascinating novels simultaneously by candle light, huddled over the kitchen table after a long day of work. The creative spirit that must have surrounded them is something I'm amazed and inspired by and it is no surprise they have continued to inspire people for years. In The Brontë Family Karen Kenyon captures the lives of Charlotte, Emily and Anne in short chapters dedicated to some of the most powerful and some of the most tragic moments in their lives. Whether it is the first sparks of their literary genius, their hardships at school, the brilliancy of their talent, the tragedy of their ends, \Kenyon covers it all in short yet insightful chapters. Although there is not much that would be new to Brontë fans, Kenyon's The Brontë Family covers them very well. I liked how every chapter began with a quote, whether from the Brontë sisters directly or from someone close to them. Kenyon also covers Branwell's life, how he brought both pride and shame to his family before his untimely end. 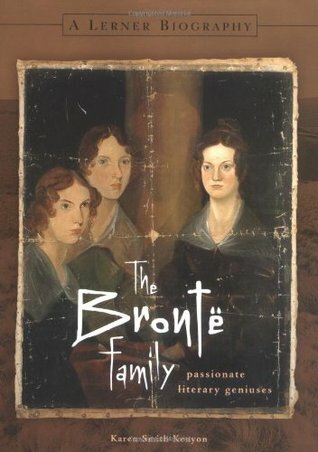 A detailed account of the lives of the entire Bronte family but dealing with Emily, Charlotte and Anne in greater detail, their life at the parsonage, their excursions into the wider world to both broaden their horizons as well as earn a living and how they all came back to the moors which they loved and the tragic end to their young lives. Born at a time when women did not venture into the world of publishing, they first published under male names and once established as "proper" authors venture A detailed account of the lives of the entire Bronte family but dealing with Emily, Charlotte and Anne in greater detail, their life at the parsonage, their excursions into the wider world to both broaden their horizons as well as earn a living and how they all came back to the moors which they loved and the tragic end to their young lives. Born at a time when women did not venture into the world of publishing, they first published under male names and once established as "proper" authors ventured into this world with a great deal of success. With happiness denied in their personal lives, they lived a very self sacrificing life giving up on love and companionship for the parsonage and their (in my opinion) tyrant of a father. This was lovely - I didn't know much about the Brontes, and I was worried this would turn out to be a pretty dense read, Actually, it read more like a story in and of itself. It was interesting (I definitely enjoyed learning more about their early lives and what drew the sisters into becoming such amazing authors - as well as Branwell, and how that affected their novels too). Not only has it reaffirmed my love for the Brontes, b I received this arc from NetGalley in exchange for an honest review. This was an interesting look at the life of the Bronte sisters. Through a life of difficult circumstances, they created and collaborated to create amazing novels that are enjoyed to this day. The author does a wonderful job of telling their story. I enjoyed this historical look at each of the Bronte's and how their work influenced each other. I received a copy from NetGalley and the publisher and this is my honest opinion. very interesting. I feel sad after reading the Bronte family but excited to see their books. Looking forward for Wuthering Heights. I happened upon this book after Ian pushed a pile of books off the shelf in the biography section at the library. I was fascinated with the Bronte sisters. Their lives were so short and sad, but they gave us such amazing stories before they departed this world. I especially admire them because they continued to write even though men told them that women couldn't write. Ha, they showed them, it is the Bronte name we remember. Lovely history of a few short but creative lives. The photos and artwork are a nice touch. After reading this, you will be thankful that dank disease ridden boarding schools are a thing of the past. You will want to make sure that your TB vaccine is up to date. You will also be grateful that Ellen didn't burn the letters. Had read a novel this summer about the Brontes then Daphne (see later review) so I needed a quick biography to settle some questions I had. This fit the bill. Designed for the YA audience so readable in a couple of hours. Really a very nice book. Short and an easy read, a good picture of their lives, not too much detail. The Brontë Family is a work of nonfiction. I'm a big fan of the Brontë sisters, so much so, that I even chose Charlotte Brontë as a subject for a research paper. This biographical piece paints a broad picture of the entire Brontë family. I learned pieces of information that I had not known before reading. For example, the fact that Charlotte was shortsighted. Also, I enjoyed how Kenyon depicted the Brontë sisters' attitudes towards children. Kenyon's work was easy to read and understand. For someone who generally does not read nonfiction or biographies, I loved this. That may be because I am passionate about the subject matter. I love the Brontë’s and I felt that Kenyon was able to give me the clearest picture of their life. She even included Branwell who often gets overshadowed in light of his sisters. We even get to know a bit more about Anne, who I seemed to know the least about. My only complaint was the pacing. It took me a while to get invested and that might turn off some For someone who generally does not read nonfiction or biographies, I loved this. That may be because I am passionate about the subject matter.